American cardinal; archbishop of New York; archbishop of Milwaukee; auxiliary bishop of St. Louis. 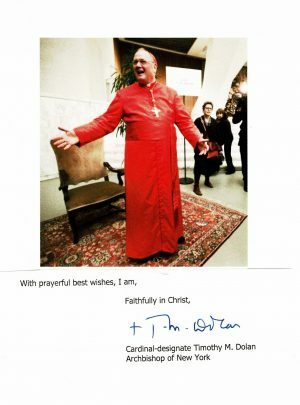 SIG – Signature clipped from a letter as cardinal-designate. Accompanied by a small color reprint image. Dolan served as the President of the US Conference of Catholic Bishops (2010-13). He is widely known for his conservative values and charismatic media personality.